Draft specifications for the painting of the 1.5 MG Avoca Tank were submitted to the Owner. A water system evaluation is underway. Design is complete for improvements to the Peak Wastewater Diversion Pumping Station. Plans and specifications have been approved by TDEC and the project bids April 11, 2017. Cleary Construction was the low bidder on the Carters Creek Pumping Station Renovation project in the amount of $651,000. The station is in service and the new pumps are running. The Contractor is working on ventilation and paving. A completion date is scheduled for March 16, 2017. SSES work began December 7, 2016 and is 33 percent complete. The new water mains for the Holiday Drive and Lantana Estates Water Line Replacement Project, which consists of the replacement of 19,000 L.F. of 6-inch asbestos cement water line, have been installed. The Contractor is currently working on installing services. Design work is 50 percent complete for the Meadowpark and Holiday WTP Improvements project which includes replacing existing gensets, constructing a new chemical building, as well as sandblasting and painting the pipe gallery, and replacing the existing settling basin equipment. The Sewer System Rehabilitation project, in the Kayser Roth area, in the amount of $449,596, is underway. Dynamic Construction is the Contractor and the project has a completion date of July. An Appalachian Regional Commission pre-application was submitted to Southeast Tennessee Development District for Industrial Park Water and Sewer System Improvements. A preliminary estimate for a waterline to Bledsoe County Prison has been submitted to the Owner. This project would consist of 86,200 L.F. of waterline, elevated storage tank, and two booster stations. The new 200,000 gallon Clarkrange Elevated Water Storage Tank project, constructed by Phoenix Fabricators and Erectors at $610,717, is in service with landscaping and fencing items to be completed as weather permits. The Highway 127/62 utility relocation project through TDOT has a letting date of June 2018. Design work is underway. The final NPDES Permit was issued by TDEC. The dormant pretreatment program has been approved by TDEC. Annual reporting is required. Design is underway for replacement of the Atkinson Park and Myrene Drive Sewage Pumping Stations including new 18-inch and 12-inch force mains. The electrical design is currently in progress. KDOW has approved plans for the South Water Treatment Plant Renovation. This project includes a new 4.0 MGD GE Water and Process Technologies Membrane Filtration System, Flash Mix Structure, Solids Contact Clarifier, and GAC Contactors. 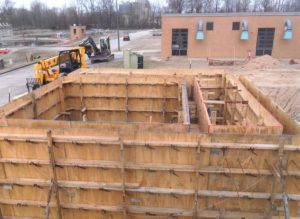 Construction of the 1.0 MG Vine Street Water Storage Tank Renovation, constructed by Preferred Sandblasting of Shelbyville, Tennessee at a total contract amount of $845,700, is complete and the Contractor is completing punch list items. A pressure study for the Graham Hill Tank Area Distribution System Improvements project is nearly complete. A draft report has been submitted to the Owner. Preliminary engineering has begun on the South WWTP Aeration Basin Renovation project. Construction of the North Wastewater Treatment Plant Final Clarifiers No. 1 & No. 2 Rehabilitation project is underway. Bowling was the low bidder at $713,892. The project has an expected completion date of September 2017. The ARC/SRF project for Lewis County and Hohenwald that extends a 6-inch water line approximately 28,000 L.F. along Summertown Hwy. is complete and closed out. The Appalachian Regional Commission recently announced award for the Water System Rehabilitation project in the amount of $500,000. Design will begin once authorization from the funding agency has been given. A kick-off meeting for the 2016 Community Development Block Grant focusing on Water Rehabilitation has been held, funds have been released, and draft specifications are complete. A report for inclusion in a 2017 CDBG Water Rehabilitation project was submitted to South Central Development District for a partnership grant between Hohenwald and Lewis County. Final plans for the sewer extension to Farm Credit Services which will accommodate future growth, have been submitted to the Owner and KDOW for review. Survey is complete and design work is underway for the $33 million Hammond Wood WWTP Expansion. Humboldt Utilities was awarded a Site Development Grant for a waterline to the Industrial Park. The $257,605 project was awarded to Barsto Construction. Preliminary work on a Sludge Dewatering Facility for the WWTP is underway. A final report for inclusion in a 2017 CDBG Renovation project at the Wastewater Treatment Plant was submitted. Construction on the Miller Avenue Wastewater Treatment Plant, with Garney Construction being the low bidder in the amount of $2,999,257.48, is underway with the Peak Flow Diversion Structure Wall to be poured soon. The project has an expected completion date of August 11, 2017. A $13.3M Disaster Community Development Block Grant was awarded for five separate projects including Miller Avenue WWTP work, sewer line replacement and rehabilitation, sewage pumping station renovation, and dual South Fork Forked Deer River utility crossings. Preliminary work is underway. Plans and specifications for the State Route 50/431 Utility Relocation have been submitted to TDOT. A pre-construction meeting is scheduled for February 24. A report for inclusion in a 2017 CDBG Sewer Rehab project was submitted to South Central Development District. Plans and specifications, the Facility Plan, and supporting documentation for the Snell Branch SPS Renovation and WWTP Nutrient Removal Facilities were submitted to SRF. Improvements at the Water Treatment Plant including Backwash/Water Supply Modifications are to begin March 6 with Contracting Services being the low bidder at $179,560. Livingston has employed the TTU Water Center for the instream monitoring program and Pennington and Associates for the bio assessment program at the WWTP as required by the NPDES permit. Design of the Monroe Water System Improvements is underway which consists of 33,000 L.F. of 6 and 8-inch water line and a booster station renovation. Survey work is 50 percent complete. A pre-construction meeting was held February 6 for a project providing for the clean out of Polishing Pond No. 1 & No. 2 at the Wastewater Treatment Plant. Low bidder was W&O Construction with a bid of $229,168. Work is scheduled to begin mid July. A report for inclusion in a 2017 CDBG WWTP project was submitted to the Upper Cumberland Development District. Survey work is complete for the Renovation of Six Sewage Pumping Stations and design is underway. 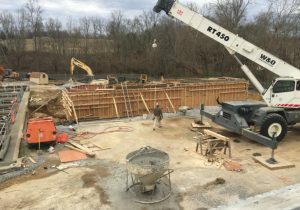 Improvements at the Water Treatment Plant are underway with Southern Flow being the Contractor for control and instrumentation modifications at a cost of $151,000. In addition, the City Lake Dam repair is soon to begin with GeoFirma as the Contractor. Horsley Construction was the low bidder for Phase I Water Improvements, which include 15,876 L.F. of 16-inch North Transmission Line, in the amount of $965,089. The water line is installed and in service. Minor tank valve vault work remains and a change order for approximately 3,000 L.F. of 6” water line is in process. 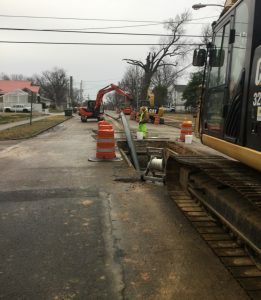 Construction of 21,000 L.F. of 3-inch and 4-inch water line on Baizetown and Cave Ridge Roads, with the low bidder being Horsley Construction at $328,711.80, is complete with cleanup remaining. The Water Treatment Plant Lagoon Sludge Removal project is complete with a change order approved to clean out Lagoon #1. Expected completion is March 2017. Preliminary work on a Manhole Rehabilitation project is underway. The NPDES Permit Renewal application is being prepared for submittal. Preliminary work on a Water and Sewer System Capital Plan is underway. Phase I of the TDOT State Route 128 road widening is complete and closed out. This project included relocation of water, sewer, and natural gas utilities. Phase II of the TDOT State Route 128 road widening utility relocation plans have been submitted to TDOT for a scheduled letting of March 2017. A semi-annual report was completed for the pretreatment program. Design is underway for the Harbert Drive Sewer Rehabilitation project and assistance with flow monitoring is being provided. The Wellhead Protection Plan has been updated and submitted to TDEC. Preliminary cost estimates to save a new large water user were submitted to the Owner. A draft appraisal of a neighboring water system was prepared and submitted to the Owner. 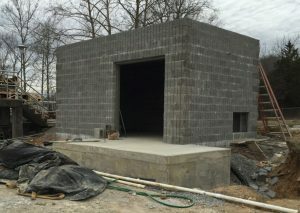 W&O Construction was the low bidder for the $2.8M renovation of the 2.16 MGD SBR Wastewater Treatment Plant. This project is progressing as planned with construction of the electrical building, headworks, and influent SPS structural concrete and masonry nearing completion. A completion date of October 2017 is expected. A Water and Sewer Rate study has been prepared and presented to the Owner by Rate Studies, LLC. The 2015 Community Development Block Grant project that included a new influent pumping station at the WWTP has been closed out. The design of a new 1.6 MGD Sequencing Batch Reactor Wastewater Treatment Plant is complete and submitted to TDEC. The final NPDES Permit has been issued by TDEC. A report for inclusion in a 2017 CDBG Sewer Rehabilitation project has been submitted. Local Limits have been approved by TDEC and adopted by the City. Construction of I-69 Phase III is continuing and utility work is anticipated to be complete within the next month. The Contractor is working on the sewage pumping station. The 2016 Utility Rehabilitation project, with John T. Hall Contracting at $1,579,347 being the Contractor, is underway with pipe bursting of the sewer. Water work has not yet started. A completion date of June 2017 is expected.